Ordering in Chinese restaurants can be hard work, which is why leaving it to the chef to decide has a certain appeal. I was lucky enough to recently visit two places that offer this option: Red Sun and Taiwan Village. In order to try the leave-it-to-us option at Red Sun, booking is essential and the party size must be a minimum of eight. They will then rustle up a multi-course feast for a scarcely believable £15/head. Of course, you can at the time of booking mention likes and dislikes as well as make special requests. Having said that I'm not sure how easy this would be if you don't speak Mandarin (a fluent Mandarin speaker, not me, made the booking). First up came a selection of starters that included dishes such as cold marinated beef slices, drunken chicken, smoked fish, tofu as well as various salads. My favourite, however, was the lotus root stuffed with glutinous rice. That said, some might find having a sweet dish as a starter as being a bit weird. Following the starters came some intermediate courses that included two different types of jiaozi dumplings (I, rather, predictably, preferred the herby pork ones to the veggie ones). Sadly, the xiao long bao soup dumplings were bit indelicate, in some instances there was no soup in the filling. Much better were the steamed scallops on the half-shell topped with glass noodles. Onto the mains, and the photos show deep-fried chicken topped with chilli-salt, stir-fried prawns, sweet & sour whole fish and braised belly pork with tofu. That was just the half of it, as there was also a stir-fry of pork, celery & tofu as well as some sweet & sour spare ribs. Then, there were the veggie dishes in the form of sweetcorn and pine nuts, stir-fried pak choi and stir-fried tung choi (morning glory). There were probably some other dishes, too! The mains were all good, but I'd be hard pushed to describe one really spectacular dish. At this point, there was some confusion, as the end-of-meal oranges were served before the dessert. However, equilibrium was restored when a sweet syrupy soup with bits of fruit and glutinous rice flour nuggets and tofu 'flower' arrived. I couldn't quite finish this off, but there was no shame in this as we had been served in excess of 20 dishes. I guess it was just as well that there were no rice or noodles to really fill us up! I enjoyed Red Sun's home-style feel, which evoked memories of simple family-owned restaurants in Mainland China. There were a few rough edges but you'd have to be a complete arse to dwell on the negatives when dinner costs £15/head. And last but not least, I'd like to thank Kay for organising this outing. At £26.50/head, the leave-it-to-us feast is pricier at Taiwan Village. However, it is less restrictive, as you don't need to pre-book and it can be ordered for a minimum of two diners. The charming manageress (originally from Zhongli in Taiwan) will ask about your likes, dislikes and spice tolerance, and shortly afterwards, the first courses will arrive. Of the half dozen or so starters, I enjoyed dishes like chopped prawns in lettuce wrap and my favourite of five-spice deep fried chicken. It was also good that the dishes came out at a nice stagger, so the food didn't get cold. The relative low point of the meal was the incongruent appearance of crispy aromatic duck as a middle course. However, the meal got back on track with some classic Taiwanese dishes such as clams in wine & ginger sauce, three-cup chicken and beef in sha-cha sauce among the six or so mains. Again these came out in a nice stagger along with some of the best egg fried rice I've had in this country. To finish off, there were desserts of which I particularly enjoyed the azuki (red bean paste) pancake. Incidentally, dessert is optional, and isn't part of the leave-it-to-us feast. For a more detailed review of this meal (with better prose and photos) please check out Tamarind and Thyme. And I'd also like to thank Rahul for introducing me to this delightful little restaurant. Whilst I'd recommend both restaurants - especially as they shine a light on two schools of Chinese cuisine not that commonly found in London: Shanghai and Taiwanese - I prefer Taiwan Village. It might cost a bit more, but the additional quality is worth it in my opinion. PS: No discussion of leave-it-to-us Chinese feasts is complete without mentioning Hunan Restaurant (where I understand the chef at Taiwan Village used to work), as they were the first to offer this option in London. Hunan is quite upmarket, and dinner costs around £40/head. I found it a bit hard work, and the fact that I haven't returned since I reviewed this restaurant nearly three years ago tells its own story. 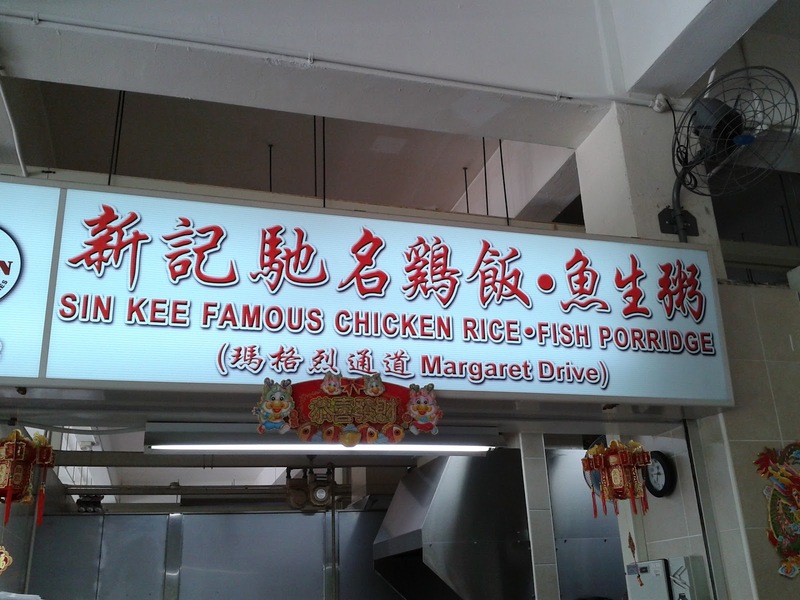 I'm a great believer in local knowledge, and I doubt that I would've ended up in the Tiong Bahru (中峇鲁) neighbourhood if local entrepreneur and blogger Eunice hadn't suggested meeting up there. Although only a short cab ride from Singapore's CBD, Tiong Bahru has a very different feel from the mix of skyscrapers and regenerated shophouses found downtown. That's due in part to some enlightened town planning in the 1930s that saw elements of art deco incorporated into the architecture of Singapore's first public housing project. Anyway, enough of the architecture and history lesson; this is, after all, a food blog! The reason for visiting Tiong Bahru was to check out Sin Hoi Sai (新海山). In local parlance, this is a zi char joint (煮炒), one step up from a hawker centre but still quite casual. To use an Italian analogy, think trattoria rather than full-blown ristorante. The food at Sin Hoi Sai is a bit like Singapore itself: a fusion of traditional and modern influences. Dishes like cereal prawns (麦片虾) where deep-fried prawns are tossed in an amazing salty-sweet-spicy mix of oatmeal, butter, curry leaves and chilli. This is a true Singapore original, with the key ingredient being a breakfast cereal called Nestum (thanks to Goz for the knowledge). Sadly, I don't think Nestum is sold in the UK, which probably rules out ever seeing cereal prawns on these shores. This is a shame, as they're SO damn good. 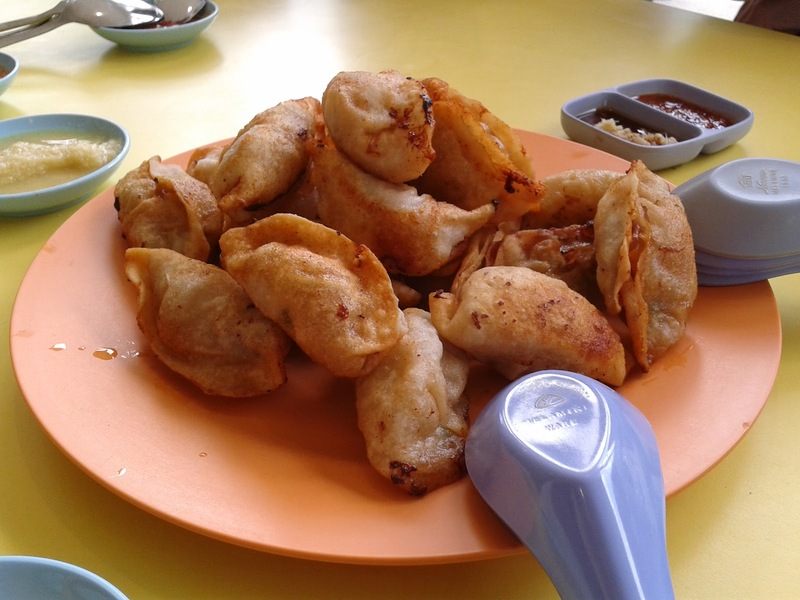 Another Singapore classic is deep-fried prawn paste chicken (har cheong gai 虾酱鸡). Sod Colonel Sanders and his mix of herbs and spices, these have nothing on the pungent prawn paste (har cheong 虾酱) in which the chicken is marinated in before it's deep-fried. Moreish doesn't even begin to describe the super savoury-umami attack on the senses unleashed by this dish. Although Singapore's ethnic Chinese have gone down their own culinary path, there are still plenty of southern Chinese classics such as steamed egg (水蒸蛋) to be found on the menus of zi char joints like Sin Hoi Sai. We ordered a deluxe version that was made with bits of century egg and salted duck egg. It was good, with the savoury egg custard being properly silky, smooth and wobbly, but I couldn't help but feel the salted duck egg element was a bit muted. While zi char, in general, is seen as a good value casual dining option, that doesn't mean you can't treat yourself. And as Sin Hoi Sai's calling card is its seafood, we went for steamed fish with coriander as the centrepiece of dinner. I can't remember what the fish was, but it was perfectly cooked. With some greens, rice, drinks, freebie dessert and, most importantly, great company, it was a cracking meal. So thanks again to Eunice for suggesting Sin Hoi Sai! Another locals' joint I visited was the modestly named Sin Kee Famous Chicken Rice & Fish Porridge stall that's located in the Mei Ling Market & Food Centre in Queenstown. 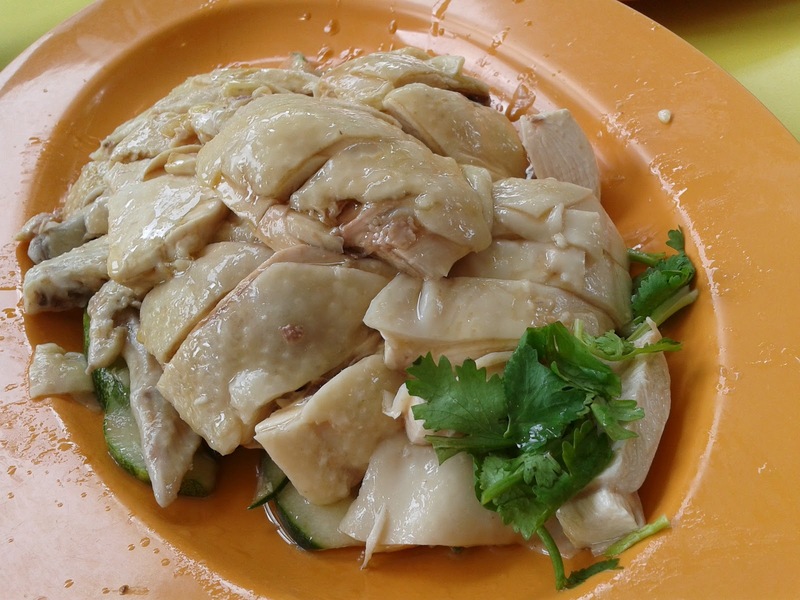 While I have no doubt that their fish porridge (congee/juk 粥) is excellent, I was here for the Hainanese chicken rice (海南雞飯). As we were a large group, we ordered a whole chicken, which came on two separate plates, with the rice served in separate bowls. The chicken was nicely done to perfection, juicy and tender (although to some heathen western tastes, it may seem undercooked). And the rice (cooked with chicken stock) was so tasty that I ordered an extra bowl. This chicken rice was really good, and I can understand why people travel miles to this corner of town for it. To bulk out our meal we also ordered some fried dumplings (guo tie 锅贴) from a neighbouring stall serving Shanghai-style dim sum. These were bloody tasty, with their crispy exterior and juicy pork filling. All in all, it was a fabulous lunch! And for that I am thankful to my long suffering Singaporean colleagues for taking me there, as I wouldn't have otherwise known about the food centre at Mei Ling Market. So much so, I feel really guilty that I had, occasionally, got hacked off with them for not always taking me to places serving local food. For more Singapore tips, albeit from a couple of years ago, please check out my posts on the restaurant scene and the cheap eats scene. I still can't get my head around the fact that there are 12 branches of Din Tai Fung (鼎泰豐) in Singapore (more than any other city in the world). It's as if the city-state should be renamed the 'Republic of Din Tai Fung' in honour of the legendary dumpling restaurant. I visited the branch at the Wisma Atria shopping mall (one of three branches on Orchard Road alone). Joining me was an old friend, Mr Pak Choi, who also happened to be passing through Singapore. Naturally, we ordered some xiao long bao 小籠包 (which come in portions of 6's or 10's). These soup-filled dumplings were as good as ever. Of the two versions we tried, we preferred the pork & crab over the standard pork, as the crab lent some sweetness to the dumplings. Moreover, the pork dumplings were (by Din Tai Fung's standards) untidy in their construction. Mr Pak Choi's favourite was the pork chop w/egg fried rice 排骨蛋炒飯. I maintain that Din Tai Fung's fried rice is the best in the world, and the pork chop was also better than I remember it being in Hong Kong. That's due in part to the five-spice powder not being as overpowering and the pork chop being on the bone. The wontons in black vinegar & chilli oil 紅油抄手 were good although I thought the vinegar/chilli oil ratio was skewed too much in favour of the former. Being a Sichuan dish, this dish should have been spicier than it was. To complete our order, we went for some stir-fried spinach w/garlic and a portion of noodles in special sauce. Both were cooked to perfection, and I particularly liked the sweet soy dressing that came with the noodles. Having said that, I'm not sure Din Tai Fung should use the term 'special sauce' if they ever open up in the UK. Six dishes between two was, probably, just about enough, but we couldn't resist something sweet in the form of peanut dumplings. This was, unbelievably, my first foray into Din Tai Fung's dessert selection, and the dumplings did not disappoint. These steamed mochi balls were filled with what tasted like molten peanut brittle laced with sesame – truly amazing! What Mr Pak Choi didn't realise when he joined me for dinner was that he was being coerced into joining the campaign to bring Din Tai Fung to London. The thing is, and I don't mean this in a patronising way, he's more of a regular guy than me. He's neither a food blogger and nor is he obsessed with Chinese/East Asian cuisine. He's just someone who enjoys eating out while being receptive to different styles of food. In other words, exactly the kind of demographic that Din Tai Fung needs to attract if it is to be successful in London. On the food front, Mr Pak Choi had no complaints, but he thought the ambience was lacking. I'm inclined to agree, as neither of us enjoyed dining in a space reminiscent of where a branch of Costa Coffee might be found in a British shopping centre. Apart from that, he could see no reason why Din Tai Fung wouldn't be a roaring success in London. Long time readers of my blog will know what's coming next! This is where I beg you to add your name to the petition to bring Din Tai Fung to London by leaving a short comment on my other blog: Din Tai Fung London Fan Club. Now I know some of you are thinking why you should bother supporting a campaign to bring a restaurant chain to London that you have never visited, and in all likelihood never even bloody heard of. Well the thing is you might not realise that Din Tai Fung is missing from your life, but until a few weeks ago nor did Mr Pak Choi. And you might NEVER know if Din Tai Fung doesn't open in London – so please sign the petition NOW! Those of you that follow me on twitter or instagram are probably already fed up of me forever banging on about how great my lunch from Eat St is. For those not in the know, Eat St is a collective of street food traders that can be found on King's Boulevard (round the back of King's Cross station). It's quite a loose collective; the various stalls come and go, and don't necessarily always operate on the same day of the week. So it's best to check out their website to see who's on when. I'm hard pushed to name a favourite, but I think Bánhmì11 just edges it. After all, I was pretty gutted when they took a break from Eat St earlier this year. Not only do these guys knock up great bánh mì (Vietnamese baguettes) but their beef pho noodle soup is pretty damn tasty, too. If you're going for bánh mì, I recommend either the Fish Q (grilled catfish marinated in turmeric and galangal), or the Imperial BBQ (grilled pork marinated in caramel and lemongrass). On another day, I may have chosen The Ribman as my favourite. 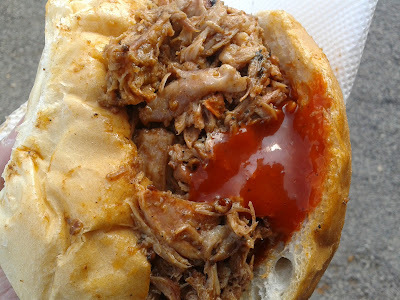 In a short time, this fella has become a bit of a legend with his ribmeat rolls (or wraps for the lightweights) topped with a bit of smokey BBQ sauce and/or the notorious Holy F**k hot sauce. Being a northerner, I like to playfully mock southern portion sizes, but The Ribman doesn't skimp. In fact, the only fault I can find with him is that he's a devoted West Ham fan. 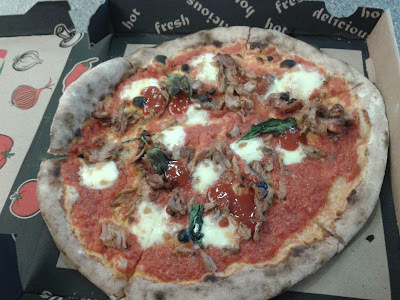 I also like Homeslice, who knock up fantastic pizzas, despite coming from a small country located somewhere in the south Pacific called New Zealand. Seriously though, the ribmeat pizza (with ribmeat provided by The Ribman) is a must-order. Otherwise, the chorizo & rocket is a top choice. The pizza can be ordered by the slice or whole. 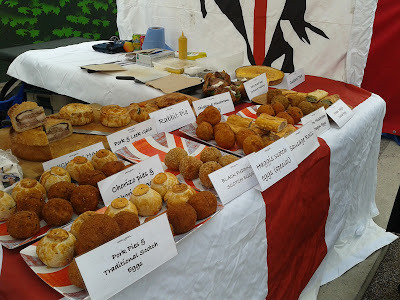 Recently, I've become a big fan of Eat My Pies, who knock up pies and pasties (both hot and cold) as well as a range of Scotch eggs. But as much as I like the occasional rabbit pie or smoked haddock Scotch egg, the custard tart eclipses all of their savouries. Other stalls that I like include the much-underrated Tongue 'n Cheek whose ox cheek with polenta is a favourite of mine, and the new kid on the block: Mother Flipper with their signature double candy bacon burger. And if you have room for something sweet, the salted caramel whoopee pies from Kookybakes always hits the spot. In fact, such is the diversity and quality of the food found on Eat St, I've only just remembered that the likes of Big Apple Hot Dogs and Yum Bun (both big names in the London street food scene) are Eat St regulars. And I have no doubt that there are other favourites that I haven't mentioned in this post! I don't want to get too preachy, but in my opinion Eat St is far more important than the multitude of high-end Michelin-starred restaurants with big name, big bollocked chefs that operate in London. And that's because I believe that the richness of a food culture is defined by the quality of everyday food from the bottom-up rather than posh food from the top-down. And while the street food scene in London won't be troubling the likes of Hanoi anytime soon, we should treasure the lunchtime legends of Eat St.
PS: All of the traders mentioned in this post are not exclusive to Eat St's site on King's Boulevard. They also work other pitches across London such as Brick Lane Market, Broadway Market and Brockley Market. New. Hip. Happening. I haven't been any of these things for a long time. Come to think of it, I don't think I've ever been hip or happening, although I was new, sometime in the 20th century. While I appreciate that much of London's foodie appeal is based on it being trendy, it does no harm to revisit some of the capital's old timers. Places like Lisboa Patisserie, where they have been quietly doing their own thing for many a year, away from the hyperbole that so often surrounds shiny and new London openings. When I pitched up there the other week, it was jam-packed to the rafters, so I did what any sane bloke would do; I ordered my pastries to go. It goes without saying that the pastel de nata, the iconic Portuguese egg custard tart, is the calling card of this joint. And my God, it was bloody amazing with its flaky pastry and burnt eggy custard. There were other treats such as the other tart (on the right in the photo) whose name I've forgotten. It was pretty good, but it was no pastel de nata. So, by all means chase the new, hip, happening joints in London town, but don't forget the old favourites. They've lasted for a reason. It's because they're good, damn good, so do yourself a favour and visit them. I live in London. Why Mr Noodles? Well simply, it's because I love noodles.